The FEI Titan HRTEM is a state-of-art Transmission Electron Microscope designed to deliver the ultimate in performance in all operating modes (TEM and STEM included). It was delivered in 2007 with a field emission gun (FEG) operating at 80 to 300 kV and an EDAX detector for elemental analysis. It is outfitted with correcting lenses that fix certain aberrations to allow imaging at a resolution below 0.1 nanometers, roughly the size of an atom. It is also equipped with a post-column Gatan Imaging Filter (GIF) 865ER offering the capability to probe the spectroscopic properties of nano-materials with sub-eV resolution. 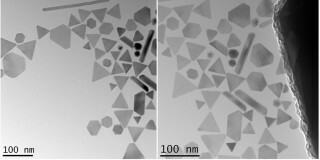 Sub‐Å Young’s fringe experiment on Gold nanoparticles showing an information limit beyond 78pm.